..so they dance! : A Total Newbie's Guide to Khanna-o-Rama. Hi! So you just heard a bunch of us Bollybloggers are organizing a little thingymaroo called Khanna-o-Rama. And you want to participate, but you're not sure how. WHAT? Khanna-o-Rama, Khanna Week, Semi-organized Fan Enthusiasm Concentration with Focus on the Almighty Khannas ... a beloved brainchild has many names. Basically, it's a thing where we devote our blogs to one particular filmi topic and this time it's Khannas. WHEN? May 3rd - May 9th, 2010. WHICH KHANNAS? Good question! We are discriminating against many a Khanna but this funfest has zeroed in on three related Khannas for its focus - Vinod Khanna, Akshaye Khanna and Rahul Khanna. WHY NO TWINKLE KHANNA? ...must you ask? You can blog about that, then! In the world of Khanna, trust me, you have to appreciate the smaller roles because sometimes it's the best you can get. YEAH, BUT SERIOUSLY, GIMME RECS. Amar Akbar Anthony (1977) - Yeah, whatever, most have seen this. But if you haven't, well, it's a good time to do so and a perfect place to start! As Ness put it, Vinod is the Man in this one. And the film is good 70's masala fun with an all-star cast and well, it's a classic! Meera (1979) - I'm pretty sure this was my first Vinod Khanna film and for that it holds a special place in my heart. This Gulzar-directed film is on the artsier, slower paced side, and tells the story of a Hindu saint Mirabai, who is devotedly in love with Krishna. Vinod plays her husband, tormented by his wife's love for the god. The visuals are lovely and I was just utterly captivated by both leads in this - Hema is striking and Vinod even better. Parvarish (1977) - If my 70's week postmania on this movie didn't entice you to watch it yet, please give it a go for Khanna-o-rama. It's an excellent film, perfect Manmohan Desai masala with long-lost relatives and entertaining songs and wackiness and pathos, but it also has a great Vinod performance. He plays a character that's a hero and an anti-hero all at once and it's just good stuff. Achanak (1973) - Another Gulzar film starring Vinod. This one is a strangely compact 96 minute long near-songless film that manages to simultanously be thought-provoking and pretty much perfect fangirl fodder all at once. The film raises questions about paradoxes of life, death and killing, and while it doesn't arrive at any amazing conclusions, it is interesting, Vinod's performance is good and I'd call it worth checking out. I intend to discuss this one pretty in-depth with spoilers (which I rarely do here) so I'd love to have others to ponder this film's messages with! Mera Gaon Mera Desh (1971) - If you have to watch Vinod as a super-evil Baddie McAwfulness, watch this one. Plus, it's educational! 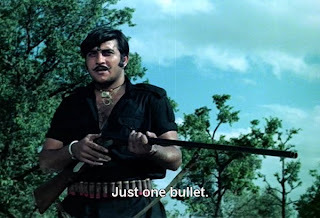 Mera Gaon is the clear predecessor to Sholay, in more than one trait, and Vinod's Jabbar may not be as legendary as Gabbar, but he is sort of disgustingly awesome nonetheless. And we get fun, young Dharmendra doing his thing. It's not an amazing movie, but it definitely is fun. I talk about the film more here. These are all well worth considering, depending on your tastes and advancedness in Vinod-watching. The Burning Train - Early 80's disaster film that has Vinod and everybody else. Seriously. It's a pretty good disaster movie and it's a solid masala film for one that takes place on a burning train. 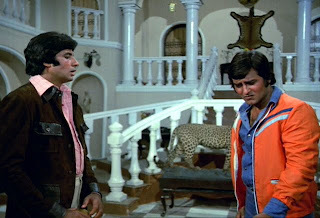 I loved the portrayal of marriage difficulties with Parveen Babi and Vinod's characters (but make no mistake - this is not a sad or a realistic film!). 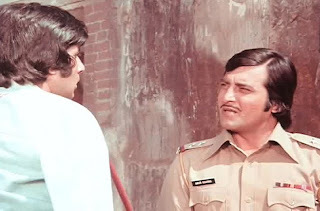 Sacha-Jhuthaa - A Manmohan Desai-directed Rajesh Khanna film where Vinod plays a cop and Rajesh has a double role as a simpleton and a bad guy. Again, not amazing but thoroughly fun film. There's some Vinod but too little, though. Patthar Aur Payal - Dharmendra and Hema star, Vinod plays baddie, but I remember the film being fun and Vinod being a pretty awesome baddie here. 99 / Wanted - Desire to keep it modern? Look now further than these two films from last year. 99 is a fun, fun, clever little comedy about the year 1999 and world of betting and scams. Vinod has a small but important role, Kunal Khemu, Cyrus Broacha, Boman Irani and Soha Ali Khan are the main leads. Wanted is an action entertainer in true Southie style (read: Hindi remake of one), starring Salman Khan, Ayesha Takia and Prakash Raj. Vinod again only has a small but equally pivotal role in this one. THANKS. - You are most welcome, imaginary reader. AND BROS KHANNA? You know, considering how little I know and have seen, I'm going to let others handle this.. Akshaye's career is slim pickings as far as great films go, and Rahul I've only seen in Earth (good movie) and Wake Up Sid (good movie). I intend to mend this before Khanna Week hits, though. WHAT NOW? Watch! Rewatch! Screencap! And prepare for the early May madness. See you then. OOOOOOO KHANNA WEEK! I cant wait to swoon over the Khanna men, I wrote a horribly long essay on Deepa Mehta's earth, so I'll definitely to spill my pyar for Rahul who is the sweetest thing ever! Akshaye was my maaw's crush object when he made his debut with hair as well back in the 90's! Khanna-o-rama is going on my calendar! I can't wait! I'll probably stick to Vinod but I'm hoping somebody uncovers a forgotten Akshaye gem! I am SO IN for this, because I keep ordering weird movies based solely on their Khanna content. Like the one starring Hot Papa Khanna and Govinda. Yes. Saving THAT for Khanna-O-Rama for sure. Hahah and THANKS FOR THE SHOUTOUT! Vinod IS the man. I'm actually really excited for Khanna-o-Rama... This is the first Bolly blog event I've been interested in (70s movies are a bit boring, and I don't care too much about Shashi). A couple of suggestions for you, veracious? Could you please do a Twitter analysis of Rahul's tweets? I know providing snarky commentary on Rahul is like poking fun at Obama (nigh impossible), but you can do it. Also, how can you suggest Akshaye movies without bringing the awesomeness that is Race? OMG. I'm so excited! FG - w00t! Akshaye gems are in great demand but sparse as far as I know. Ness - Oh no, Govinda & Vinod? Is this some dreadful early 90's film? Hmmm good luck! I look forward to reading that review. Anon - But I love Rahul so much it might just result in intense fangirling. Some people have got the tweet magic, he's one of the few. I ..kind of hated Race. It was so bad .. I don't know, I wasn't into it. Sorry! Other Vinod Khanna recommendations include - "Insaaf", "Satyam eve Jayathey", "Imtihaan", "Haath ki Safai", "Dayavan" - enjoy. Rahul Khanna had a small role in Love Aaj Kal. He is also the hero in the movie "Hollywood Bollywood"
Akshay Khanna was good in Aaja Nachley and Mere Baap Pehley Aap apart from Dil Chahta hai. Of course many bollybloggers would have seen Taal. Forgot to add one of the most popular and enjoyable 70s movie of Vinod Khanna is " Aap ki Khatir" (not to be confused with the new movie with the same title that has Akshay Khanna!). Aap ki khatir (70s one)- handsome VK with Rekha, good songs (pyara ek bangla ho, bombay se aaya mera dost etc) and humour. Am in permanent need of Vinod Khanna recommendations. I'm really looking forward to Khanna Week - I like Vinod, Akshaye (more than most others, it seems) and Rahul a lot, so I'm definitely looking forward to participating and more importantly, reading other people's thoughts. On Papa Khanna recs, Vinod had a nice supporting role in Yash Chopra's Sridevi-vehicle 'Chandni', although Rishi Kapoor and his annoying character threatened to ruin the film. Vinod was kinda awesome though, blogger Pessimisissimo described him as having a cool (Bryan) Ferry-esque vibe, and I agree. Another must see VK movie is Kudrat. Hema Malini and VK make a handsome pair. Sadly the main hero is Rajesh Khanna. Looking forward to your review of this movie! DG - I like Akshaye but he's done too many bad films that don't inspire much confidence. Which is sad.. Like I wish he had at least a couple of films as good as DCH but he's been in much bad or just mediocre films, or roles that I wish were bigger. Ah. Anyway. Filmbuff - I make no promises about getting to Kudrat by Khanna Week but I'll keep it in mind. Will you please spearhead the Saif Ali Khan-a-thon when Agent Vinod is released? Only we have to watch movies prior to Dil Chahta Hai?